Hello, wrestling fans and welcome to the first Ring Of Honor Wrestling review of the year 2015. Nathan here as always to bring you your weekly dose of honor, so lets get right down to it. The show started off as we are brought into the arena, as Kevin Kelly and Steve Corino welcome us to the first episode of ROH TV in 2015 and we head to the ring for the first match of the evening. Result: Roderick Strong defeats Mark Briscoe via pinfall with the End Of Heartache. Thoughts: The match started out with some groundwork from two guys who have two completely different styles. They seemed to make it work though as the match progressed, which was good to see. Early on Mark hit Strong with a Belly to Belly suplex as Strong rolls to the outside, but Briscoe meets him with a dropkick through the ropes which knocks Mr. ROH down and to the barricade. Later on Strong recovers and the two men find their way up to the top turnbuckle where Roderick Strong delivers a top rope super plex to the master of redneck kung fu. Later in the match as Strong is on the outside of the ring, Mark goes onto the apron, runs off and nails Roderick with a flipping neckbreaker. Mark gets back into the ring and tries to do another dropkick through the ropes, but this time Strong catches Mark by the feet and flips him up onto the apron. Strong then rolls Briscoe back into the ring where he delivers the End Of Heartache to get the 1-2-3. Fun opener with two guys that I figured wouldn’t work well together due to contrasting styles, but I was pleasantly surprised by how the match turned out. From there we go to a commercial. After this, the ROH matchmaker Nigel McGuinness makes his way out to the ring to announce that the main event for tonight will be for the number one contendership to the ROH World Title, as Michael Elgin takes on Hanson. This brings out Tommaso Ciampa who isn’t too happy with the news. Nigel proceeds to tell Ciampa that while he accidentally hit a referee a few weeks ago, he will not be fired due to his actions because it was an accident. Nigel then goes on to say that although Ciampa isn’t fired, the zero tolerance policy for abuse against ROH officials is still in effect. He then says that Ciampa owes him one. Ciampa grabs the microphone and says that Michael Elgin didn’t beat Tommaso Ciampa at Final Battle, but Tommaso Ciampa beat Tommaso Ciampa. Out comes Michael Elgin, Ciampa tells Elgin that nobody wants him (Elgin) in ROH. Elgin then says that he wants a piece of Ciampa tonight and insists that Nigel add Ciampa to Elgin’s match later on with Hanson to make it a triple threat (I hate it when they do this because it makes the guy doing it look like an idiot). However Elgin gets his wish and Ciampa is added to the match to make the main event for tonight’s episode a triple threat match, where the winner will get a future shot at the ROH World Title. From there we go to another commercial break. When we get back, we see another backstage promo this time with Maria Kanellis, who says some words regarding Jay Briscoe. She says that if he wants his redneck world title back, which is now the “Title Of Love”, he will have to take it from her. I’m not sure where they are going with this one. From there we go back into the arena for the second match of the night, which is a first round match in the 2015 Ring Of Honor Top Prospect Tournament. The way it works is that there are eight guys in the tournament. The winner of the tournament will receive a future ROH World Television Championship Opportunity. Result: Will Ferrera defeats J Diesel with a roll up to advance to the next round of the tournament. Thoughts: This match was not good at all. It’s not often where I will say that an ROH match was bad, but this one was bad. The two started off in the ring and quickly made their way to the outside. J Diesel gets back into the ring and attempts a flying maneuver, but misses, causing Steve Corino to yell “Crash and Burn” on commentary. It was the first crash and burn moment of 2015, and trust me kids there will be more. As the two are still on the outside of the ring, J Diesel would pick Ferrera up and deliver a fall away slam against the guardrail. Back in the ring and Diesel has the advantage as he applies a Tequila Sunrise on Ferrera. Will Ferrara would roll up Diesel to pick up the win and advance to the next round of the tournament. This match wasn’t good at all and the crowd didn’t care. I like the concept of the top prospect tournament and all, but it’s a tough task to introduce a new crop of guys into a promotion where the fans are used to seeing certain types of wrestlers. Normally top prospect tournaments in the past haven’t started out this bad, so I hope this isn’t the case through the entire duration of the tournament. Hopefully as it progresses people will become more familiar with these wrestlers and they will show more emotion as the matches continue. This match could have been better if it was shorter, but having two guys that people aren’t familiar with go at it for an extended period of time is a recipe for disaster and that’s exactly what this was. From here we go to the main event, which is a triple threat match (as outlined earlier) for the number one contendership for the ROH World Title. Result: No winner due to the match being stopped. Thoughts: First off Michael Elgin has new theme music and it’s AWFUL. I’ve never seen someone take a turn for the worse character wise in ROH faster than Michael Elgin. Ever since he stated that he wanted a fee to do podcasts, his public opinion has seemed to plummet and with this heel turn, it seems like he is more true to life than he ever has been. It’s really awkward to watch and I’m not a fan of it, but it is what it is I guess. The bell rings to start the match and Hanson and Ciampa quickly jump Elgin and dump him out of the ring. The story throughout this match was that while it was a triple threat match, it was pretty much different combinations of the three guys fighting each other one on one until three fourths of the way through it. Hanson stacks both Ciampa and Elgin in one of the corners of the ring and hits Ciampa repeatedly in the chest as Elgin is trapped underneath him. Hanson picks up Ciampa and dumps him onto a fallen Elgin with a Death Valley driver in a very well done spot. That was followed by a German Suplex fall away slam spot where Elgin gave Hanson the slam, but was german suplexed by Ciampa. Hanson would then powerbomb Elgin shortly after recovering to pick up a near fall. Elgin then goes to the top rope and hits a flipping leg drop on Ciampa for a near fall. The best spot in the match came when Elgin did a hurricanranna to Hanson and landed on a downed Ciampa to pick up a near fall. Ciampa makes it to his feet as both him and Elgin would reset, and Ciampa hits Elgin with a short-armed lariat for another near fall. Ciampa gets the upperhand on Hanson and has him pinned before Elgin pulls the referee out of the ring to prevent the pinfall from happening. Hanson and Ciampa then go to the outside of the ring and Elgin flies over the top rope to take Hanson, Ciampa, and the referee out with a flying move. From there, another referee comes down to the ring and stops the match so we do not have an official number one contender as of yet. That will do it for me and this review of Ring Of Honor Television. I hope everyone had a safe new year. I also hope you enjoyed reading this review and that you are looking forward to all of the great wrestling that 2015 promises to bring us. This first week was absolutely amazing from not just ROH, but from all fronts (well not WWE really) and I enjoyed the week, as there were more ups than downs. Before I leave you for the week I wanted to plug another fellow blog writer by the name of Kianna who writes her blog over at http://kiannafurywrestling.blogspot.com. Be sure to check out her blog, as well as ours as she also reviews some Ring Of Honor stuff, as well as anything she can get her hands on. 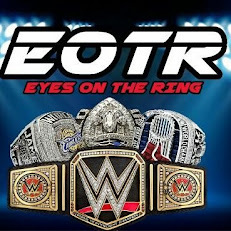 Lastly be sure and visit EyesOnTheRing.blogspot.com as much as you can and catch up on all the latest things that the team brings you. Also be sure to give us a follow on twitter @EyesOnTheRing and Like us over on facebook at Facebook.com/EyesOnTheRing. Finally be sure to tune into the relaunch of Eyes On The Ring radio, as we are starting back up in 2015 after a brief hiatus. We are now located at http://www.blogtalkradio.com/elitepodcastnetwork so be sure and tune in to help us ring in the new year as well as the brand new #EPNERA. Well, so long and I will see you next week.